blacksmithing, jewelry, glassware, pottery, woodworking , sculpture, music, art and local food restaurants. So the more they get to know this beautiful place will emerge the attractions that invite us to know more of the same municipality. On a tour of the main streets will be able to meet the parish of St. Peter the Apostle, a real masterpiece of baroque and beautiful, continues and will surely find the Shrine of Our Lady of Solitude, as it is in the corner , the southwest side; continues to the main meeting place of talquepaquenses, Jardin Hidalgo in the central square with its characteristic kiosk and countless boxes; Leaving the square you will find El Parian, with its beautiful center and its outer arches around; Nearby is the Mercado Municipal Benito Juarez, where they are from basic food to handicrafts. You should also consider a visit to City Hall and his paintings, as well as the historic house, located in Independence and Contreras Medellin. 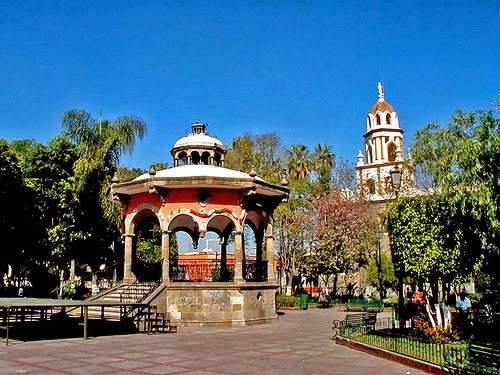 Tlaquepaque is a series of walking tours for all tastes, which can be performed at no charge and are served by specialized guides; you just have to register with two hours notice in Tlaquepaque Tourism Board in Morelos # 288. There are historical tours, historical trade and craft, besides the already famous tours "From round in Tlaquepaque", "Saturdays with streets color", "recreational Domingos" and other no less interesting as the night made by the Centro Cultural El Refugio . As you can see, Tlaquepaque has a lot to enjoy, not to consider the simple architecture of its streets and made to walk by them practicing the art of buying and chacharear, is itself an attraction, where visitors are framed by their white walls, pavers, large planters, the tops of quarry blacksmith and gates.